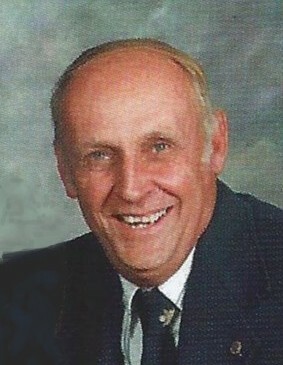 Obituary for M. Gordon White | Myers - Somers Funeral Home, Inc.
M. Gordon White, affectionately known as “Whitey” to his many friends, 82 of Altoona died Saturday morning January 26, 2019 at his residence following a short battle with pancreatic cancer. He was born July 27, 1936 in Altoona a son of the late Melvin G. and Dora V. (Palmer) White. He married Alice Jane Porter on June 16, 1962 in Huntingdon. Surviving are his wife Jane; two children, daughter Deborah J. Utesch (Matthew) of Bethlehem; son Michael G. White (Laurie Stepanek) of Washington, DC; two grandchildren, Sydney and Tyson Utesch both of Bethlehem; a brother, Daniel White of Osprey, FL; two sisters, Ruth Anne Hess and Carole Jean Lingafelt (Bob) both of Altoona; and three sisters-in-law, Ruth Jackson (Jim) of Huntingdon; Barbara Troychock (John) of Bloomsburg; Helen Porter of Harrisburg; and numerous nieces and nephews. Mr. White was a member of Second Avenue United Methodist Church, Altoona. He was a 1955 graduate of Altoona High School and a 1959 graduate of Lock Haven University with a BS degree in Secondary Education. Whitey retired as a physical education teacher from the Altoona Area School District with 32 years’ service where he was a cross-country and track & field coach. He was also a basketball coach at the former Logan Junior High School. He was part of the coaching staff for three state championship cross-country teams at Altoona Area High School. He was a co-founder and manager of Greenwood Golf, Altoona. Whitey enjoyed spending time with family; hunting with his dogs; swimming; attending Pitt football and basketball games with his son; coaching his grandchildren; officiating track & field and basketball; and Thursday breakfast with retired colleagues. He was a member of Mountain Lodge #281, F & AM; Jaffa Shrine where he belonged to the Patrol / Directors Staff; Greenwood Lions Club; Lions Sight Conservation Foundation of Blair County; Heidelberg Country Club; and was a PIAA official. Friends will be received from 4-7 p.m. Wednesday January 30, 2019 at Myers-Somers Funeral Home, Inc., 501 Sixth Avenue, Altoona and 10-12 p.m. Thursday January 31, 2019 at Second Avenue United Methodist Church, Altoona where a funeral service will be held at 12:00 p.m. (noon) with Rev. Brian Sandell. Interment will be made at Blair Memorial Park, Bellwood. In lieu of flowers, the family suggests memorial donations be made to Second Avenue United Methodist Church, 130 Second Avenue, Altoona, PA 16602 or to the Altoona Area School District Foundation, “Gordon White Athletic Scholarship Fund”, 1415 Sixth Avenue, Altoona, PA 16602.